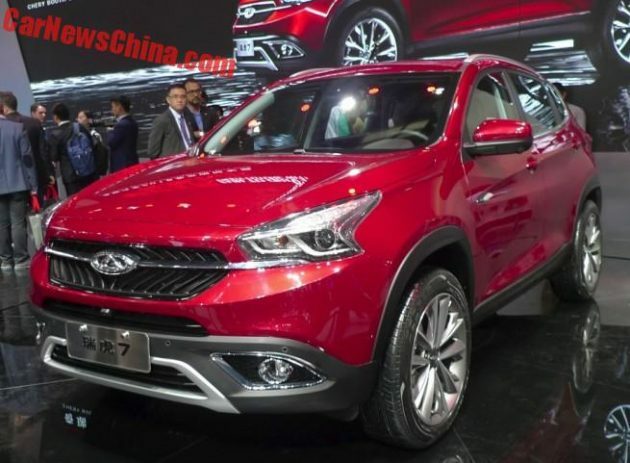 On the stands at the 2016 Beijing Motor Show is the Chery Tiggo 7. Making its debut for there, the vehicle is actually a production version of the 2012 Chery TX Concept, and it will officially go on sale in China sometime in October this year, Car News China reports. According to the report, Chery is looking to transform itself into a brand that appeals to the younger generation and the Tiggo 7 aims to kick things off. Here, the SUV is seen in two colours – red and white. It features the brand’s new grille that’s synonymous with Chery’s design language. It’s dressed in black cladding, while chrome trim is applied to the windows. Up top, it appears to sport two bars meant to look like roof rails. At the rear, the protruding hatch has a line that runs neatly across the edged tailamps. Moving on into the interior, one will be quick to notice the red that goes onto the centre console and the front seats. The air-vents and three-spoke multifunction steering wheel comes in a simple design. There appears to be a touchscreen headunit, and a rotatable knob of some sort sitting above the gearshift. As for power, the Tiggo 7 is said to be getting a turbocharged 1.5 litre and a 2.0 litre four-cylinder petrol engines. Meanwhile, a hybrid variant will also be available and potentially an all-electric variant as well. That said, official details have yet to be released by the company, so we’ll have to wait and see. Both Chery and Proton should merge company. China wont be that stupid. They should wait for proton to bankrupt and take over which is cheaper. this is actually not bad looking at all, imv. I really dunno what proton is doing…. What does P1 have to do with this anyway? What Proton has accomplished so far? Using tax payer money to sustain the company? Many China car makers already doing better than proton. And proton is still rebadging other cars and build a junk Iriz. Sooooo coming back to my point. How is this article related to P1 anyway? and how are they related again??????? Still testing the acordana and ertigah. Proton should learn from China’s carmaker company how to design a car. You mean “How to COPY other car”, right?